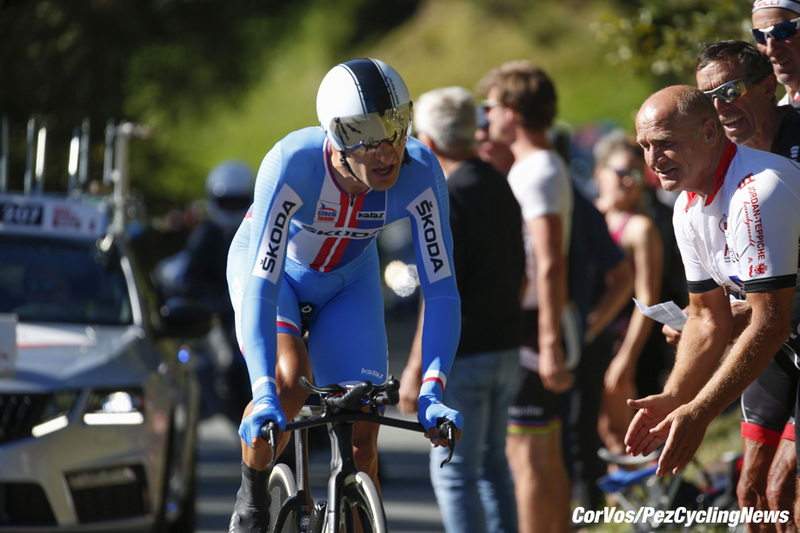 PezCycling News - What's Cool In Road Cycling : WORLDS’18 MEN’S TT: Rohan Rules The World! WORLDS’18 MEN’S TT: Rohan Rules The World! 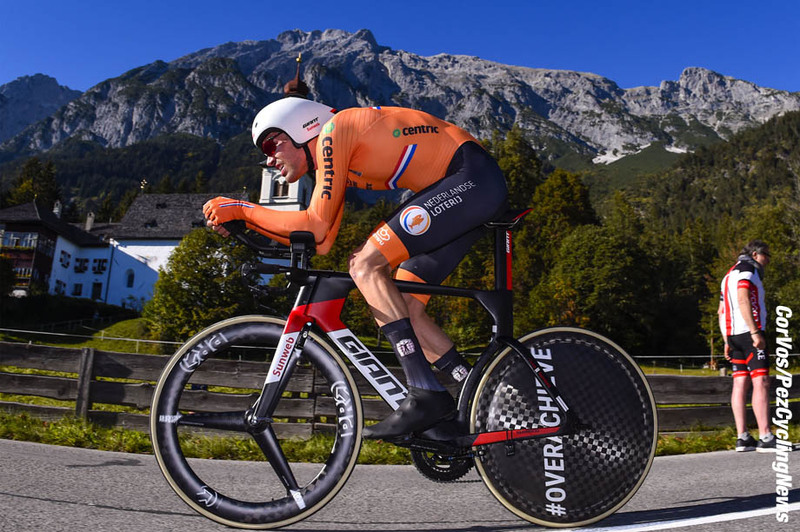 Worlds Race Report: Defending time trial champion, Tom Dumoulin, was right to fear Rohan Dennis in Wednesday's World TT championships. 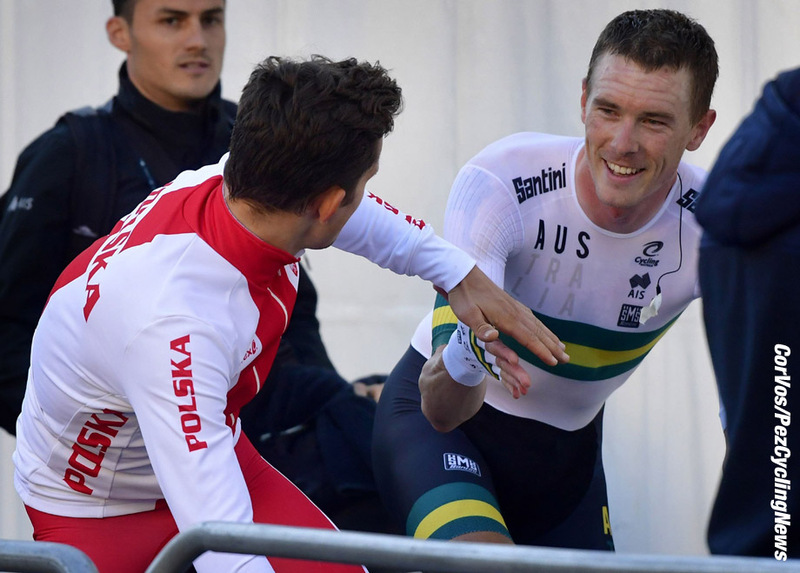 The fast Australian demolished the opposition on the Innsbruck course to beat Dumoulin and Victor Campanaerts by over a minute and twenty seconds. Dennis: The new King of the time test? On another sunny day in the scenic Austrian Tyrol, it was that whippet of a man, Rohan Dennis (Australia) who will wear the rainbow jersey for the next year. 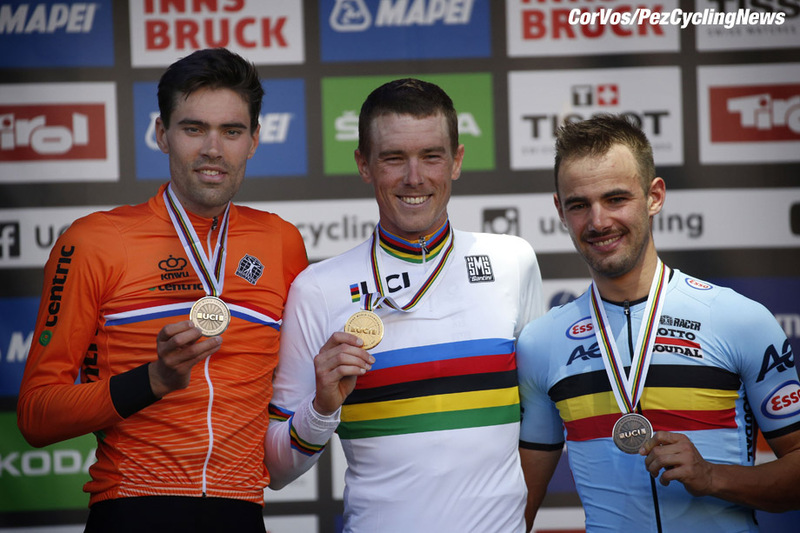 Defending champion Tom Dumoulin (The Netherlands) salvaged silver by less than a second from ‘raging bull’ Euro Champion Victor Campenaerts (Belgium). Dennis was quickest all the way through, including up the monster col 30K into the day’s work – his winning margin was 1:22, a huge margin at this level. 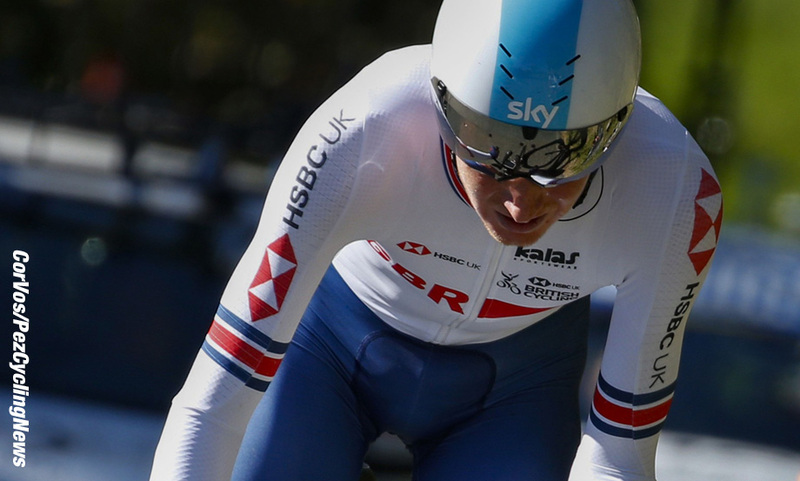 Wilco Kelderman (The Netherlands) is first off on a course which has it all, flat, fast start for 30K, whacking big climb, undulations and a downhill finish. Not unlike the TTT course. It’s a lovely day for time testing on the Tyrol, sunshine and little wind. 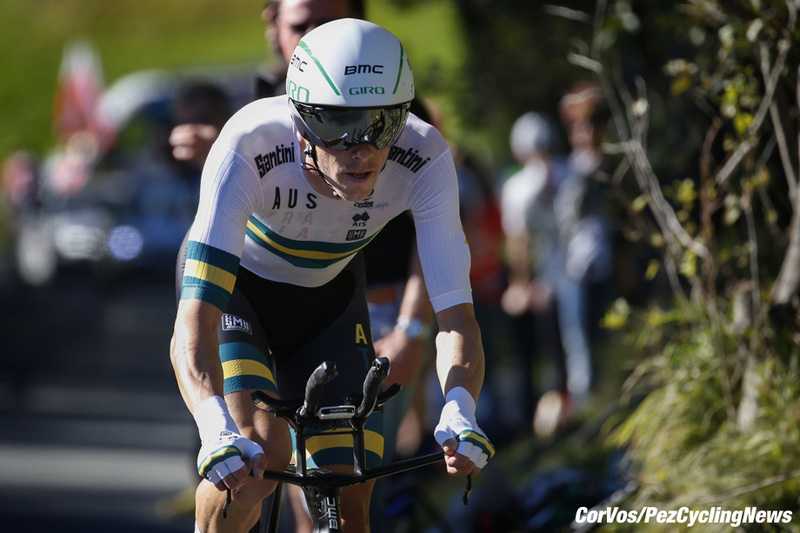 Kelderman stokes the big gear and averages 51 kph on the flat opening kilometres. 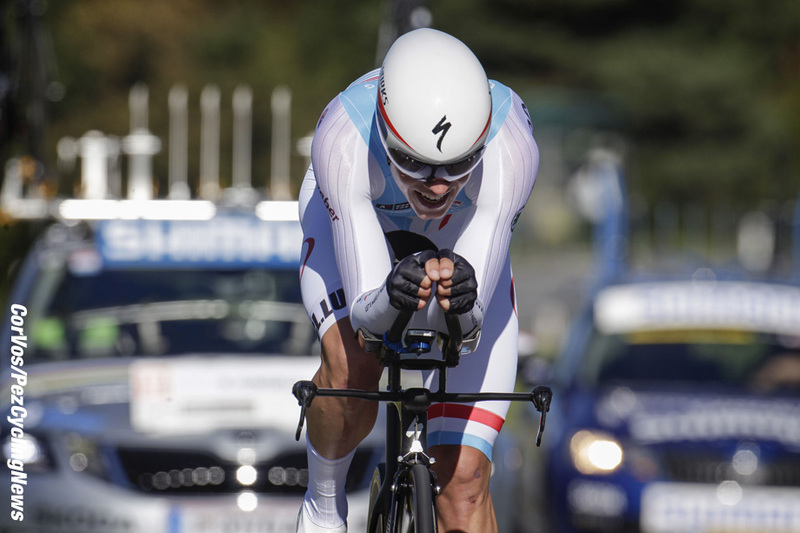 Joey Rosskopf (USA) launches, he went well in the last TT of the Vuelta; then Tao Geoghan Hart (GB), Silvan Dilier (Switzerland) all ‘handy guys.’ Germany’s Max Schachmann was part of the winning QuickStep TTT squad; he has TT ‘previous’ with a Worlds u23 silver in the discipline. Barta (Czech) goes top at check one but not for long as Rosskopf spins neatly through and takes the lead – until Martin Toft Madsen tops him. 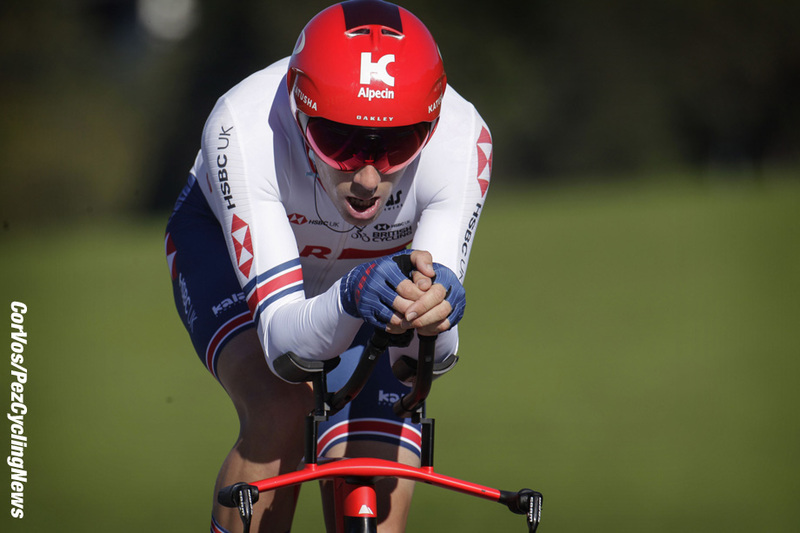 He’s Danish hour record holder and lies fifth in the all time list of hour rides with 53.619 kilometres. Bodnar (Poland) misses the Dane’s mark – and he’s no slouch. Ryan Mullen(Ireland) is out there, stroking it smoothly, flat back, a real stylist but too heavy for that climb. Check two and Madsen is top, 49 seconds up. Dowsett (GB) is off late but I fear his best days are behind him. 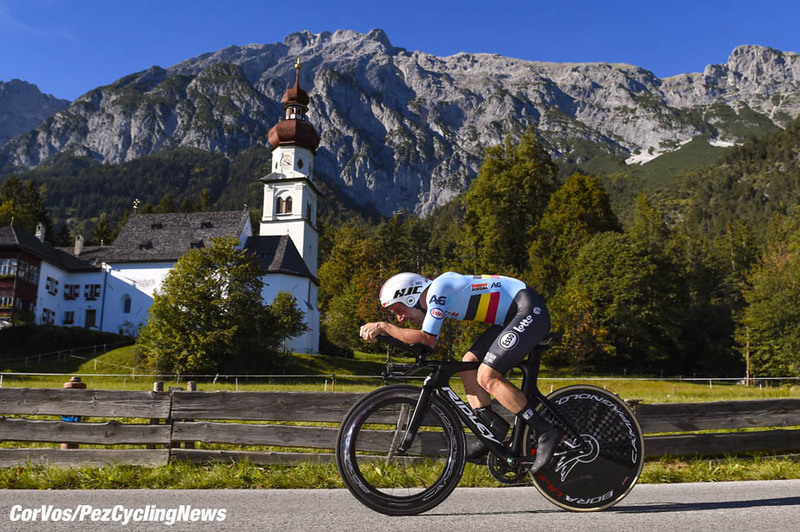 The last 10 is where the medals should go – Swiss champ Stefan Kung is ninth from last and a strong force against the watch with TT wins in Suisse and Binck Bank. Nelson Oliveira (Portugal), ex-champ Tony Martin, ex road world’s best, Michal Kwiatkowski (Poland), Euro champ Victor Campenaerts (Belgium), another former world champ Vasil Kiryienka (Belorus), former Euro champ Jonathan Castroviejo. . .
Just two to go now. Meanwhile, Tejay goes top at check one and Barta leads with a 1:07 at the line. 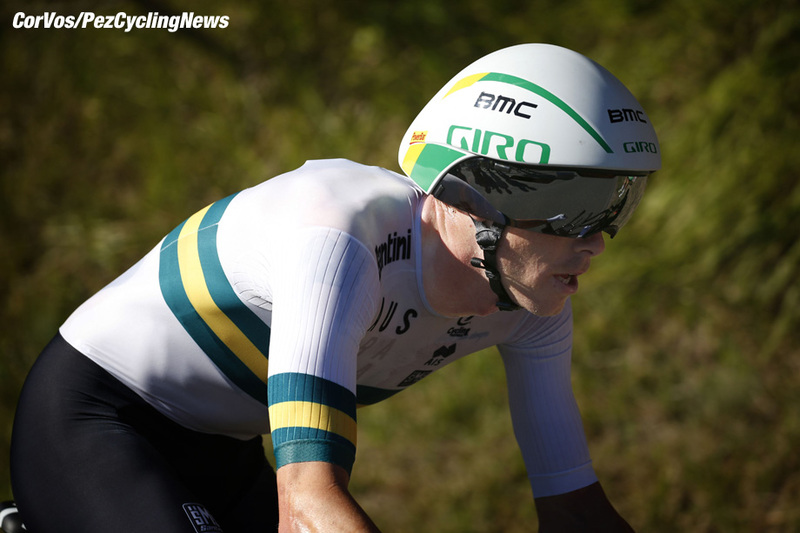 Rohan Dennis (Australia) launches, the young pretender with two Vuelta chrono stages to his name. The reigning king, big Tom Dumoulin is away. They’re all out there. Jungels misses the mark at check one, as does Dowsett. 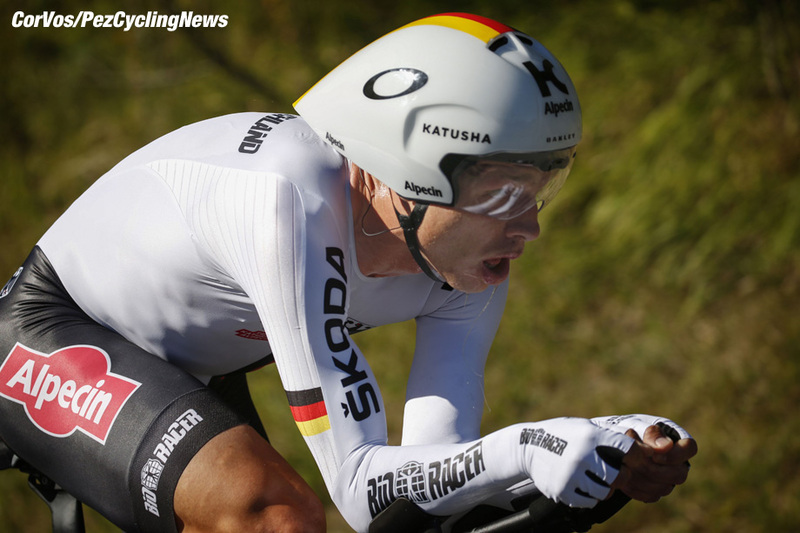 Tony Martin is riding lower gears than usual – keeping the cadence high ready for the climb. Soren Kragh Andersen leads at check one now, ahead of Tejay. Mean times, his compatriot, Madsen tops the leader board at the line with 1:06, that’s the new benchmark. Former World Pursuit Champion Kung goes top at the first check just before Tony Martin turns back the clock and blows the Suisse time away. 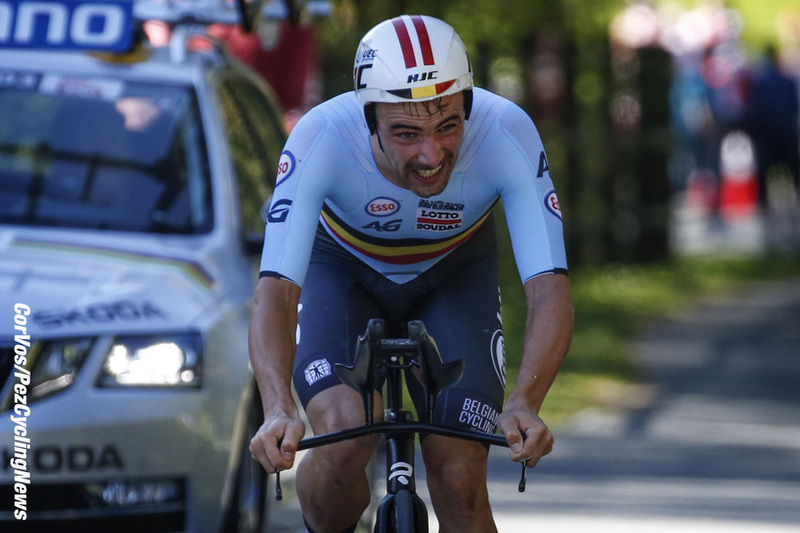 Campenaerts is less than a second back – but the Belgian won’t enjoy the climb. Dennis, check one, 15 seconds up on Martin. Dumoulin is nine seconds down on Dennis - but the big climb is to come. Madsen continues to lead as Dutchman Van Emden misses his time. Dennis is stroking it very smoothly out there, perhaps also a higher cadence than usual so that climb isn’t like hitting a brick wall when he goes down from the 11 to a 14/16 or even lower. Dumoulin too looks good, those long legs turning a big gear with apparent ease. Kung on the climb, off the tri-bars, trying to find the right gear, out of the saddle – it’s tough, for sure. Martin spins the climb and goes top at check two. It’s a long, long climb as Kung begins to look rough. Paddy Bevin (New Zealand) goes top at the summit of the hill – nice job. Campenaerts is charging the early part of the climb but it’s a long, long ascent – ahead of him, Kung is seizing up, this is one heck of a climb, Oliveira catches the Swiss champ. . .
Dennis now on the climb as he catches Castroviejo, the Aussie is flying. Dennis off the tri-bars and fighting the grade. Tony Martin is looking very sweet on the hill, still in the saddle and spinning nicely. Oliveira now top at the summit, Martin misses that mark. But Kwiatkowski tops Oliveira, he must have blasted the hill. Dumoulin on the climb now, off the tri-bars as Campenaerts tops the climb and posts best time – a nice one from this bull of a man. Dennis is pumping a bigger gear than most on the climb and on visual looks very good. At the line, Denmark’s Madsen continues to lead. Dumoulin does not look as good as Dennis on the hill; the Aussie champ tops the hill a minute and more up on Campenaerts. 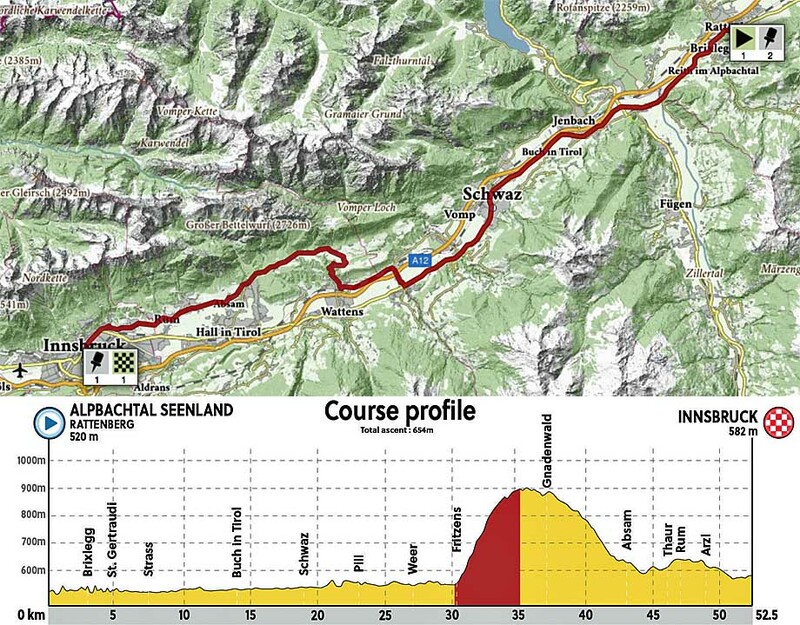 Dumoulin has dropped a minute at the summit; Dennis looks like the man in the rainbow stripes tonight. Bevin goes top on the line, a 1:05, out of the hot seat for Madsen. Dennis is flying off the hill, the descent is so fast that Campenaerts freewheels in a crazy dangerous crouch. Dennis does likewise at 80 kph – wild! And now he catches Kiryienka – enough said. Campenaerts is beasting the closing kilometres – impressive. Oliveira goes top at the line, a short 1:05. Dumoulin nearly drops it on a descent – ooops! Martin misses Oliveira’s time. Kwiatkowski takes the lead at 48kph. Campenaerts now, ahead of Oliveira, a 1:04 – impressive. Dennis continues to fly, red kite, in what looks like the 12 to me. He stops the clock with a 59.6 kph ride, 1:03:02, 1:21 up on Campenaerts – wow! 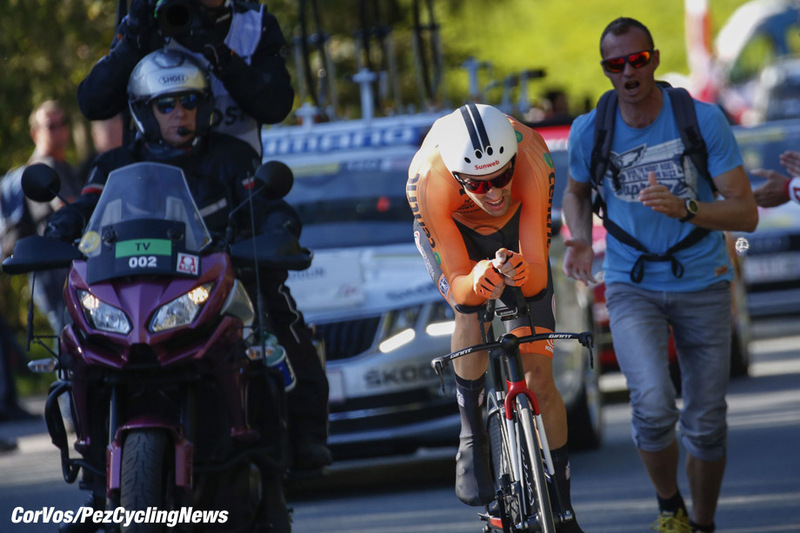 Can Dumoulin salvage silver? Yes! by less than a second. He’s wasted, disappointed, empty, tears – never nice to see. But that skinny man Dennis was best man on the day. A great day of racing again. Roll on Sunday and keep it PEZ! 25. Josef Cerny (Czech Republic) at 4:49.29.